In the blink of an eye Leah Batchelor, aged 21, life changed. She was left unable to talk, walk or move, when she lost part of her brainstem. Somehow, Leah started to get flickers of movement back and with her faith in God she prayed for even more. Leah started to record her feelings while in hospital and has used these along with her mum's journal to create this book, five years after her life changed. Inspirational Leah Batchelor, a young Dundonald woman who has defied the odds in her recovery from Locked–in Syndrome, has written a book about her experiences. In the book, entitled Believe, Leah reveals how she was confined to a hospital bed able to move nothing but her eyelids. She felt flickers of movement returning and prayed to God for more. 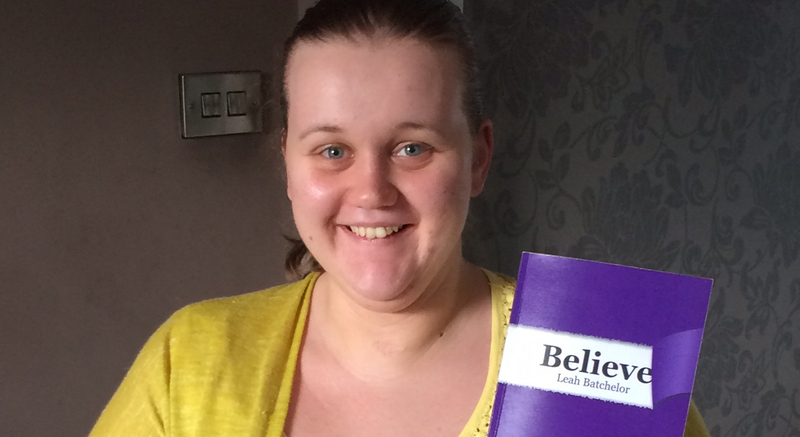 Leah Batchelor with her book ‘Believe’. Leah was just 21 when, in September 2011, she suffered a major brain stem stroke caused by an aneurysm. Her prognosis was not good and her parents Allison and Tom were told she may not survive. Five years on she has graduated from University, passed her driving test and is now a published author! A parishioner at St Michael’s Parish Church, Belfast, Leah admitted that her faith in God was tested in the early days of her illness. Leah’s book chronicles her life since that fateful day in 2011. “It was very hard to write, but I started writing when I was still in hospital as at the time I’d no speech and it was my way of understanding what I’d been through,” Leah said. Leah graduated from the University of Ulster with a 2:1 in Graphic Design last December, and at the ceremony amazed everyone with her courageous determination to walk on the stage to pick up her certificate. Since graduating, she has been doing freelance work and is on the lookout for a permanent part–time job. She is a Girls’ Brigade leader in St Mary’s, Ballybeen, and has been helping to develop the Lower Shankill brand COILS (Church of Ireland Lower Shankill). Leah is still in therapy, and travels to London to a specialist clinic once a year for a fortnight of rehabilitation treatment as no similar service is available in Northern Ireland. Click the button below to add the Believe to your wish list.